My best friend Eddie passed away yesterday. We adopted Eddie (fka Magic) a little over 8 years ago from Heartland Lab Rescue. He was about 6 months old and very much a puppy. It was not all an easy road, but we grew into a family and Eddie was treasured by his forever home. He loved to chase squirrels, go swimming in the river, ride in the car with his dad, and run with his mom in the park. He loved to give hugs and snuggles. He lived a happy life. A few weeks ago we found out he had a malignant tumor on his heart and a few weeks later he was gone. We learned many things from Eddie. He taught us to love unconditionally, find joy in the silliest things, and most definitely to live in the moment. He was a wise soul and by having been a part of our family changed our lives forever. Thank you Heartland Lab Rescue for bringing him into our lives. Our beautiful Anna Grace gained her angel wings just moments ago. She has been struggling since Wednesday afternoon, unable to hold down food or water. Our vets came to the house to examine her; it was obvious she was very ill. She was sedated in the grass and slipped away while I told her how much she is loved, and gently washed her face with a warm wash cloth, whish was one of her favorite things. Jude lay by her side the whole time, with his nose very close to hers. Funny how intuitive they are. As you might imagine, I am heartbroken, but so thankful we had the opportunity to make her world better, as she did ours. Thank you for loving her first. I adopted Samie when she was 18 months old from your organization. 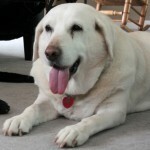 She was listed Lab/St Bernard. She was the junior member of my pack. Unfortunately, she started having back pain in August. We have been going back and forth to the vets, x-rays were taken, and a MRI was done on Tuesday. The results to the MRI showed a tumor along her spinal cord, biopsy was completed and the results were returned today. It was determine the tumor was Chondrosarcoma which usually effects dogs at age 6. Samie would have been 7 in December. I want to thank you for allowing Samie to be a part of my pack and she will be missed dearly. Because the tumor effected the spinal cord not all would be able to be removed. Samie was put to rest yesterday with her pack around her at home.